The Contestants began to arrive. 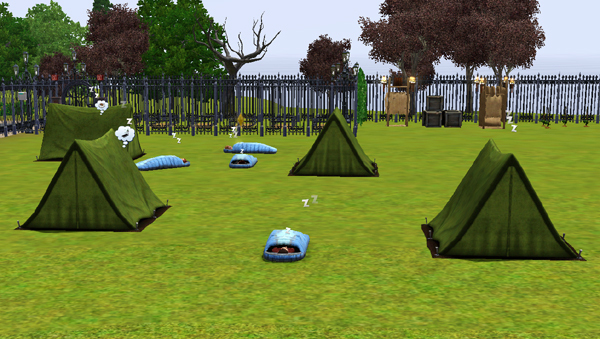 The reactions to the neatly arranged pile of sleeping bags and tents near the gate were varied. 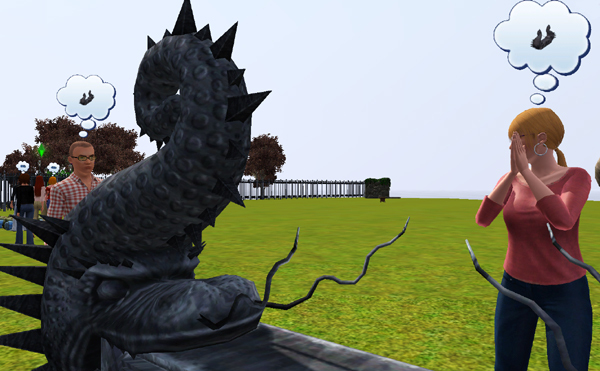 Jess and Myskaal were more interested in the dragon sculpture. "So, said Rufio, "I don't quite get this. The immigration person said we would be going to this camp - but she said we EIGHT. There are only seven of us here. Who's missing?" Meggie, possibly the brightest of them, worked it out. "We're the ones who escaped from the Tenetment in Twinbrook. Remember, when the flood hit, we were already on the sea in that floating trailer of my Auntie's. So we survived when lots of others didn't. And now this - do you think this is some kind of detention centre?" Snow Bawl was indignant. "I was never at the Detention Centre at Twinbrook. I was a successful writer! They just lumped me in with you lot because I came from Twinbrook!" "Don't care what you were. You're here now, Miss La-de-Da. I don't see any computers or typewriters here, do you?" Motoki said it was "More like a holiday camp. Look, we are by the sea - and it looks as if it will stay in its proper place now. I'ma gonna grab me a tent and settle in. If it's a mystery, it'll sort itself out eventually. Or a meteor could have dropped on us all and we are in H - well -" he looked around at his companions, and shrugged. "Hell, I suppose." "But where's the food?" worried Snow Bawl. "What will we eat?" "You'll have to get off your fat bum and fish, or grow things, and won't that be hard!" laughed Jeromy. "But I don't know how to grow stuff! Nor fishing! All I know how to do is write romantic novels!" "Me too," said Myskaal. "All I can do is play the guitar - and there are no guitars here either." Motoki insisted on everyone leaving the room while he showered. 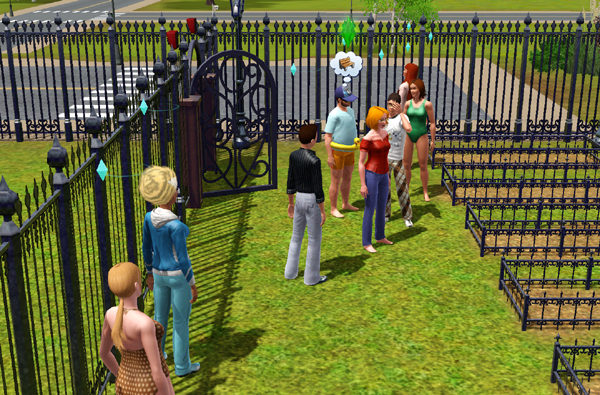 Everyone had to go into the cemetery, the only place that was fenced off. "Need moar fencing," said Jesslla. "The immigration person said someone would be along to tell us our rights and things..." said Rufio gloomily. 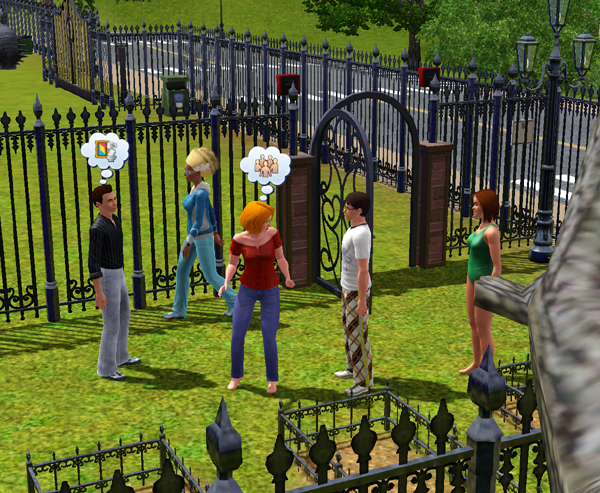 "Sounds like Twinbrook already." "I wonder what happened to Pes?" "He'll have landed on his feet. He's a survivor." "I heard something about that - you know that miner of his? Something to do with the tunnels it makes causing problems with the sewerage systems in Twinbrook - and the sewers being full of dumped waste from the Science Labs." "I wonder if he was detonating stuff down there as well..." wondered Rufio. "Who knows? Who cares? We have to live here now, whatever happened. I'm gonna sunbathe." The last remaining contestant arrived, scowling as usual, and limping. "I've had to walk MILES! They dropped me at the far end of the island.I have blisters on me blisters." "Be glad you're still alive," said Motoki. "There's tents there. Stick your feet in the sea, that will help"
Rufio had somehow managed to keep a book in her pocket, and settled down to read it. Jessla also had some books. "let's pass them around, I have a feeling we will need all the skills we can get." "Wow! Is that Titlights?" Indeed it was. Tita was jogging along the road, not very fast, but she was definitely approaching the gate to what already felt like their domain. 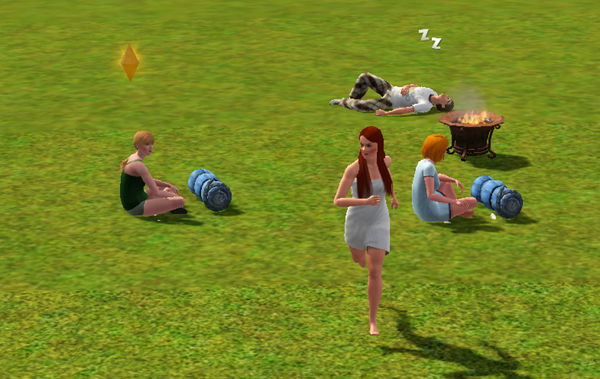 She told them to sit around the firepit, as these appeared to be the only chairs around. "Now, I have to tell you the rules here." "YOU? We don't want your rules. Go away." sneered Jeromy. "You'll take me seriously eventually. Listen or don't, it's all the same to me, I'll have done my part by telling you." The most important thing is that MOST of you are going to DIE. That got your attention? OK. There will be a challenge each week, some kind of test. But the one who dies will not necessarily be the one who loses the test. The one who goes will be the one who is the MEENEST. You can't see the cameras but they are there, all over the Lot. Most of the time you'll stay here." Ignoring shouts of "Yay! and Holidays by the sea" and "Who appointed you? ", she continued "You have to produce your own food, otherwise you will get VERY hungry very fast. I'm got a few seeds with me, which I will give to Meggie, as she has the highest gardening skill. The fish here were not poisoned by the Cataclysm, and you have a makeshift outdoor loo and shower over there, next to the graveyard. Questions?" "Graveyard?" Meggie, having been singled out for the seeds, now felt she had to take this seriously. "You are kidding aren't you? This is all a big con? a joke? in your usual awful taste?" "Oh, shoot, she's telling the truth," said Jeebus. "And count them...."
There were seven newly prepared graves. "If I get the chance I will bring more seeds - I've got a little garden going at my place. Or you may be able to find some around the island." "Oh, so we're not prisoners then?" Meggie was feeling more than a little oppressed by all the company. Tita smiled. "Not exactly. But there's little here to go to. Most of the buildings on the island were demolished because they were unsafe. There's just my house - thanks be to SimGoddess for protecting me! - and a couple of small parks that survived. Don't think you can come to my place, it's locked up tighter than Fort Knox. I'll be back tomorrow with the first challenge. Oh, I should mention that the weather here is usually fine and sunny. Jess has already been sunbathing - oh Jeromy, thanks for joining us - lovely rubber ducky! Enjoy!" She turned on her heel and left. Motoki announced he was going to go look for a decent fishing spot. Myskaal agreed, but Snow for some reason did not approve. Rufio and Snow decided to upgrade the toilet and shower. At least they could make sure that they didn't leak! They roasted a few anchovies and some marshmallows, and nobody got much sleep. Jess von Camelid is a Self-Sim from this thread at MATY. Motoki Mo's Self-Sim from this thread on MATY. Meggie Who is a Self-Sim from this thread on MATY. Myskaal Asimaha is a Self-Sim from this thread on MATY. 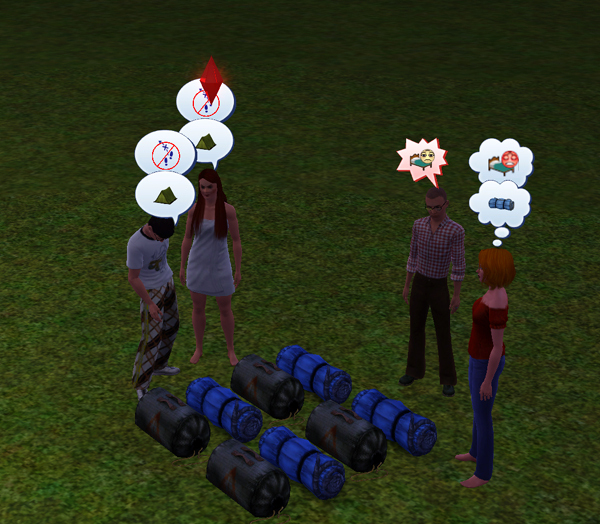 Snow Bawl is a Self-Sim from this thread on MATY. 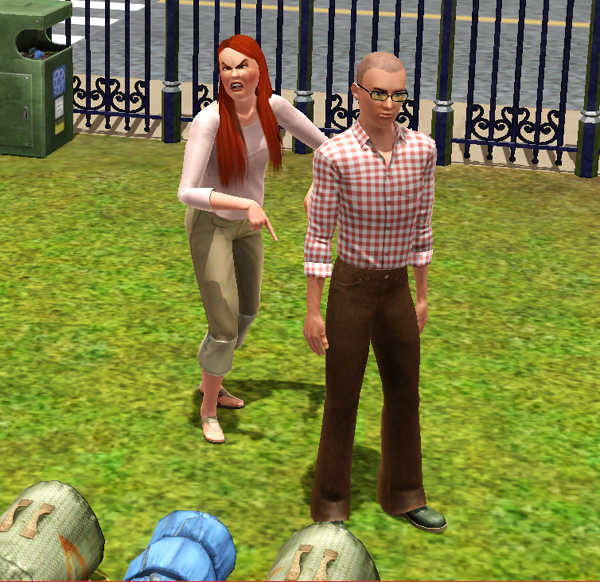 Rufio Simself is a self-Sim from this thread on MATY. 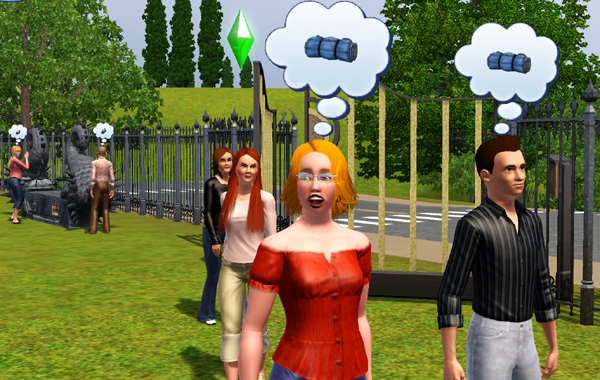 Jeebus is a Self-Sim from this thread on MATY.